). We also saw several interesting monuments built in plazas throughout the city - it seems like there are an endless array of sculptures and interesting buildings to see. 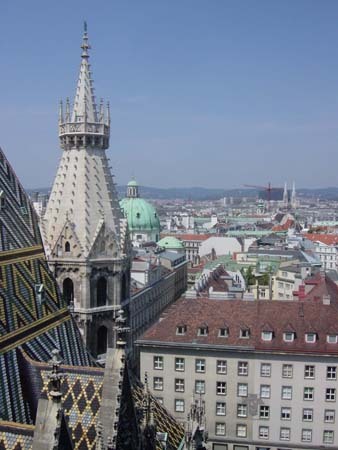 There is a very interesting mix of architecture throughout central Vienna - Gothic, Baroque, Classical and Modern - they're all interspersed, and there has been significant controversy over the years as new buildings have been put in place. We learned that the world-famous opera house was widely criticized when it was built, and was said to look like a train station. For dinner, we met Michael Ploderer and his friend Julia Virag (through Servas). We had wonderful food at a café located in a nearby museum, and enjoyed learning much more about life in Vienna. 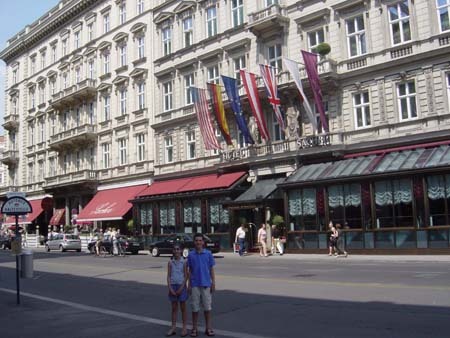 Michael and Julia have lived in Vienna their whole lives, but have traveled significantly. We enjoyed hearing their perspectives about Austria, the U.S., and several other countries we plan to visit. 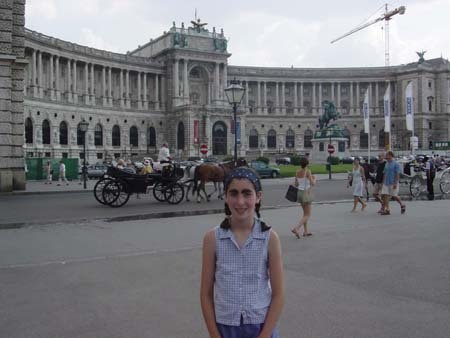 After dinner, Michael drove us to the Hofburg Palace for a concert that we had bought tickets for earlier in the day. 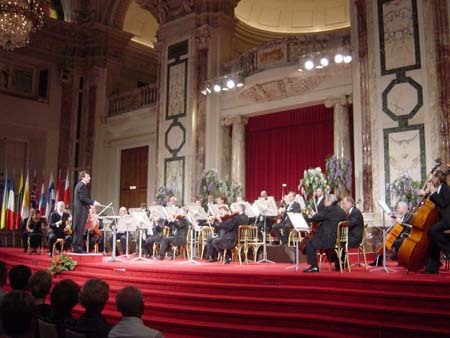 This was a very enjoyable concert, with an orchestra that played a whole series of pieces by Mozart and Strauss. We were pleasa ntly surprised that the concert also included opera singers (the Vienna opera takes a summer break every year, so this gave us at least a small taste of the opera here). After dinner, we met up again with Michael and Julia, and we strolled through the city before heading to their favorite ice cream shop for a late-night dessert. All-in-all, this was quite a day! We got back to our hotel room after midnight, very tired but satisfied in all we had learned and experienced. We also went to bed knowing that we had an early day ahead of us tomorrow, since we have a train to catch to Bratislava in Slovakia! Outdoor eating and drinking in Europe is a major part of the European lifestyle. It has many differences from the United States, which we found interesting and unique. 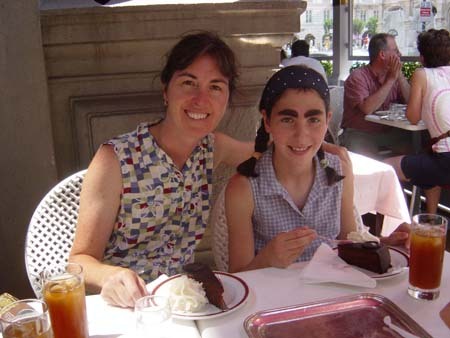 As we walked down the streets of London, Paris, Vienna, and many other cities, there were outdoor cafes with huge awnings stretching as far as you could see. 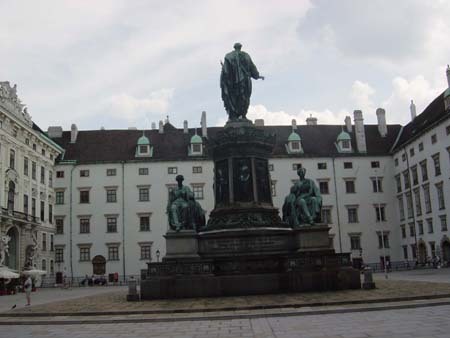 We've also seen beer gardens (Munich and Salzburg) and outdoor eating events. These three examples reflect the importance of eating and drinking in Europe. We have seen outdoor cafes in just about every place we've visited so far in Europe. They're everywhere!! People will sit down hours at a time socializing, and hanging out enjoying the sunshine. In the States you would never see as many people spending that much time at a café. We have also seen people sitting out at cafes at all times during the day. The other thing that we've noticed is that people often order drinks such as tea, coffee, soda, and cappuccino at these cafes. I can't imagine going to a café and not ordering food! Another example is the beer gardens. Beer gardens are something that we had never seen before. The first time we saw one was in Munich. It was a cheerful, funny, and crazy scene that we had never experienced. About a hundred huge wooden picnic tables were set up outside beside a lake. Near the tables were stands where you could buy meat, sodas, and of course beers. The beers were sold in 1 and one half liter mugs. Everyone got the huge liter mugs, except my dad. We all got a kick out of a group of drunk guys singing songs, drinking beers upside down, and falling asleep right on the benches. Everyone went there to drink, including old men and woman. We also had a fun time watching a big fat lady chugging down a one liter mug of beer. It was clear that the beer gardens were a daily event for her!! We have seen many other beer gardens since then (Salzburg and Vienna) and have concluded that they are much more popular in German-speaking countries than other areas in Europe. Outdoor eating events are also important to the Europeans. The most recent one that we have attended was in Vienna. In the summer, there is a music festival that takes place in Austria, particularly in the two main music cities Salzburg and Vienna. In celebration of this festival, there was a huge screen set up near city hall, which showed excerpts from operas every night. Hundreds of citizens gathered in the square to see the opera. In the square was a huge selection of foods from various countries across the world. Each country had its own stand, where it displayed it's choices of food. Tables, ice cream stands, and benches were all set up in the center of the square. This was a huge social event and it seemed that everyone was there. The square was so packed with people that you could barely walk. When we arrived, we saw all these people, but not a single police officer. We also found it strange when our food was served on glass plates and our drinks in glass cups. You could easily just walk away with the plates and cups without being caught. Europeans seem to be more trusted than Americans, which we have not only seen in Vienna, but all over Europe. If an event like this was set up in the States, there would be police everywhere, and plastic cups and dishes. The scenery also contributed to this outstanding site. Beautiful fountains, trees, shrubs, statues, and architecture were surrounding the square, which made this event even more enjoyable. 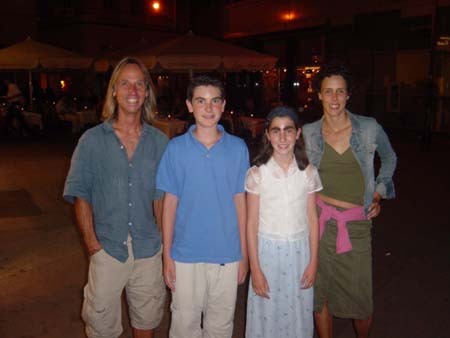 We were truly amazed at this great social event that was so different from what we had ever experienced in our lives. Throughout the past four weeks, we have noticed many differences in breakfast in each country that we have visited. So far, the breakfast in other countries has been much than in the States. Our first different breakfast was an English breakfast. Here we found that the morning meal consisted of eggs, bacon, ham, mushrooms, tomatoes, and tea. In France the breakfast was very simple. It was a light breakfast which included bread, croissants, jam, cereal, small amounts of meat, and juice. At this point, we all couldn't wait to get back to the U.S, and have a big stack of pancakes, waffles, bagels, and Mom's greasy bacon. We now greatly appreciate the big and filling breakfast's back home. The next three countries we visited were Switzerland, Germany, and Austria. The breakfast in these countries was similar, because each was German-speaking. The breakfast here was more filling than in France, but still just wasn't the same as at home. The main difference was that a major portion of the meal was meat (salami, ham, and pepperoni). Besides the meat, there were also tomatoes, cucumbers, cereal, bread, hard boiled eggs, jam, cheese, juice, and fruit.